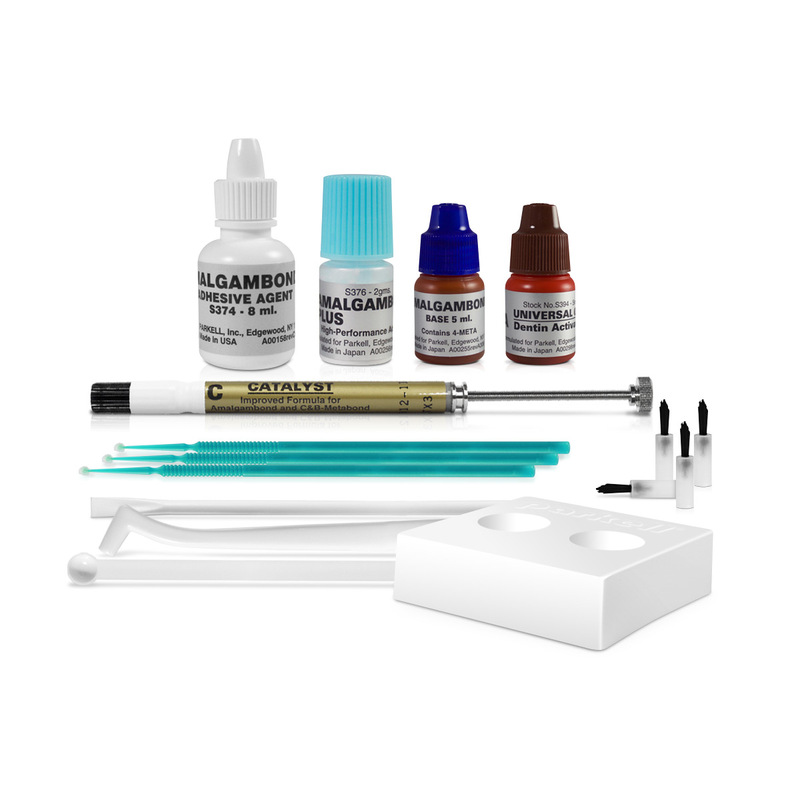 Dentin/enamel gel activator Adhesive agent Amalgambond base Amalgambond catalyst High-performance additive powder Accessories. Strong, self-cure bonds without the need for a curing light. Works equally well with composites, alloys and ceramics. Minimally invasive preps eliminate the need for pin retention. No varnish or liners needed. Dramatically reduces chances of marginal leakage. NOT JUST FOR AMALGAM—COMPOSITE, METALS, PORCELAINS, LITHIUM DISILICATE AND MORE! ONLY AMALGAMBOND® PLUS consistently bonds to enamel, dentin and cementum, as well as the most commonly used restorative materials like metals, porcelain, pressed ceramics, lithium disilicate, amalgam, and ESPECIALLY COMPOSITE! ONLY AMALGAMBOND PLUS works successfully in the darkest recesses of a severely decayed upper molar—it’s a self-curing agent that doesn’t need light to cure. ONLY AMALGAMBOND PLUS works as a profound desensitizer while it bonds, utilizing its time-tested 4-META penetration promoter to seal the cut dentinal tubules and lock out post-op sensitivity. ONLY AMALGAMBOND PLUS has decades of successful clinical studies and hundreds of positive scientific references. ONLY AMALGAMBOND PLUS works successfully in the presence of small amounts of moisture, whether it’s water or saliva. Amalgambond PLUS contains hydrophilic monomers, so it isn’t bothered by seepage like temperamental light-cured bonding agents. These reasons are precisely why most, if not all, modern restorative dental procedures can still benefit from the use of one of the world’s most extensively-tested bonding agents, Amalgambond PLUS.